There is more information available on this subject at Ananke group on the English Wikipedia. "We still sense something among the Anankes." 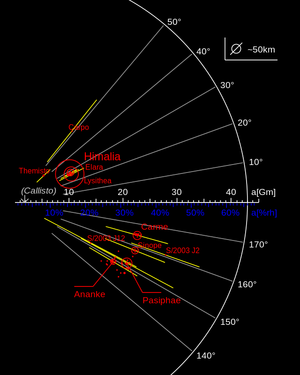 The Ananke group is a collection of seventeen cataloged satellites in an irregular retrograde orbit around Jupiter, ranging in diameter from 14km for the largest body, Ananke, to approximately 2km for the smallest known body, Euporie. In addition to those named above, there are thousands of bodies within the group that are too small to detect, ranging from a few inches to 1.2 km in diameter. Astronomers believe the group was formed when an asteroid (which may have been 28 km originally, extrapolating from the sizes of the other satellites) was captured by Jupiter's immense gravitational field and fragmented due to a collision with another body. The fact that all of the objects cataloged thus far within the group have similar orbital eccentricities, inclinations and semi-major axes further supports this hypothesis. Mara Sov's Tech Witches hypothesize that the House of Wolves Prime Servitor, Kaliks Prime, may be hiding somewhere within this group of satellites after the conclusion of the Reef Wars. Ananke is also the name of a retrograde irregular moon of Jupiter.